The Music Bed (TMB) team needed development support partners to help scale up their music business. They already owned a digital agency and photography business but needed help with starting up. Music bed team members are well networked individuals in their businesses domain hence starting up this idea was a great kick for their careers. TMB is now one of the top stock music licensing and production websites available. This was an agile project, constantly evolving, with ever growing complexities in payment structures, licensing types, and functionality with implementation of a unique split payment module for multiple payment types, bifurcations, and monthly payouts. The project called for an experienced development team to work on a tight product management plan that can ensure fast and secure results. One of the major requirements was to build a scalable and robust platform for their system. Development followed the MVC framework and hosting servers were Amazon Cloud Servers. We created a system that would run with a complex digital file management, keeping a single instance of the site intact while adding new functionality and modules at the same time. The project called for a highly available product on servers that would have large amounts of traffic. All the while the site was doing business, server maintenance was a consideration. The security of the product was paramount to the business and for the naive users of the website i.e. the artists. Once the website was developed and made live, it showed great response with immediate increase in web traffic and in turn a need for more comprehensive modules. We setup up a dedicated team including an expert in AWS implementation who enabled a high bandwidth intrinsic platform. Dedicated resources were allocated for complete project management and execution to ensure seamless production and delivery of the project. MVC Architecture and Code Ignitor is used as a base framework to build the core business functionality. Payment processes structure, ecommerce flow and accounting were defined and built into the website system using PayPal mass payment integration with custom settings addressing multiple payment mechanism requirements. We implemented private URLs and AWS S3 for product security. Suggestions were made for shifting the project to AWS cloud for scalability and better traffic management. Integration of AWS S3, EC2 and later RI (Reserved Instance) was done on demand of reducing the upkeep cost by 30-40%. With the success of the web application, there was an immediate need for an IOS mobile application. We provided support in API integrations for the mobile application which included full scale of features and functionality provided by the website. Launch resulted in 30% more sales. 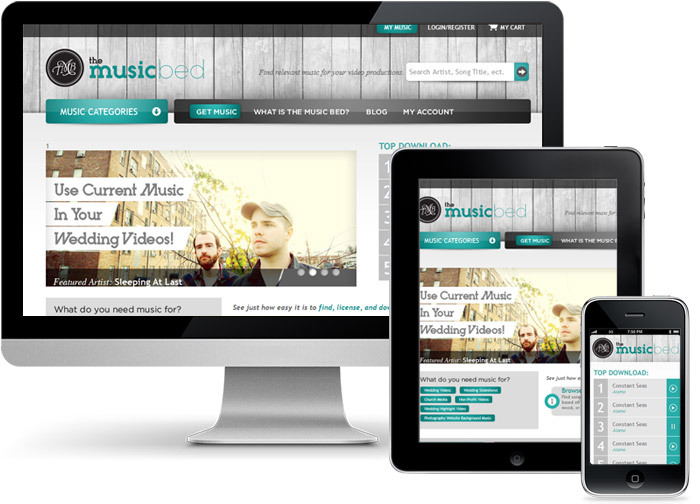 Music bed was a big success on both web and mobile platforms. Its success continues making them the leading stock music eCommerce website across the US. They have won many awards and achievements in a very short span of time. In the first 2 years after the launch of the website and mobile services the website traffic increased by 250% and the revenue increased by 400%.